Every year shortly before Christmas, my chorus, The Knoxville Choral Society, collaborates with The Knoxville Symphony Orchestra for The Clayton Holiday Concerts, a Christmas tradition in our area for some 30 years and counting. Concert week is hectic, with late night rehearsals and, for those of us with day jobs, work as usual and 4 shows over 3 days that weekend. It’s a grueling, exhilarating and fun time of camaraderie for all of us. Backstage at the venue a few years ago I took the time to pay closer attention to my surroundings than I had in the past. Among the many quirky artifacts I noticed were numerous hats hung up on a wall. I assume many of them are costume pieces from theatrical productions held there over the years, although some may be actual hats from firemen, soldiers, ball players and other professionals who wanted to leave their mark backstage. Hats were invented to provide warmth, shelter and protection from the elements. Over time they became fashion statements as well as parts of the unform for various professions. Designs also vary from place to place and culture to culture, both for professional and decorative headwear. In the Stone Age when I was setting up my social media profile, I gave a thumbnail sketch of my life and the roles I play…the hats I wear. No one among us is just one thing, after all. We all wear many different hats, filling roles as life circumstances call us to do. Switching from one hat to the next sometimes feels frantic, as we shift among our various roles and responsibilities. We juggle so many activities and demands from day to day, sometimes from hour to hour. Some of the hats we wear weigh heavily on our heads, our hearts, as we face hard choices, regarding our health or the health of a loved one. Sometimes a hat may feel too tight, if we are in a job or a relationship that doesn’t fit us. Sometimes the hat just doesn’t flatter us or bring out the most attractive qualities in us. Sometimes it even feels as though, rather than us wearing the hat, the hat wears us. You get the idea. I live in Knoxville, Tennessee. Dixie, The Buckle of The Bible Belt. This is The South. 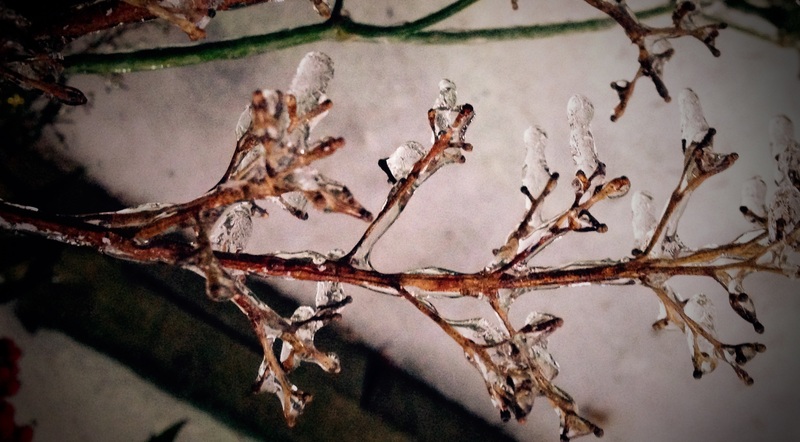 We get the occasional snowfall here, but we are not used to ice. But here we are, iced in due to a winter storm that dumped sleety frozen pellets on us this past Monday and now is dropping snow on top of the ice. 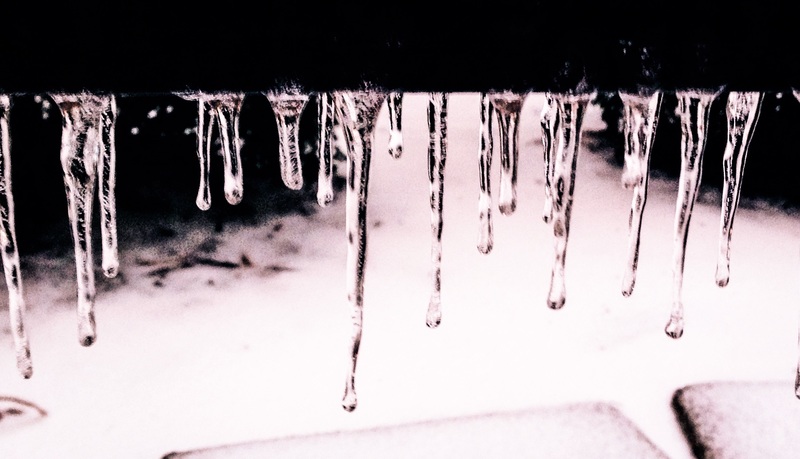 Record low temperatures are predicted for tomorrow night and much of the city has come to a halt. Many schools are closed as well as a number of businesses. I ventured out last evening for a rehearsal with Knoxville Choral Society, as we have concerts scheduled this week with the Knoxville Symphony Orchestra, and if at all possible, the show must go on. The roads at that time were not any trouble to navigate. My only issues were getting the ice chiseled off my car and eventually getting the door to my fuel tank un-frozen. It was good preparation for returning to work today. Monday I was not scheduled to work, and Sweet Pea was sent home early from his job. 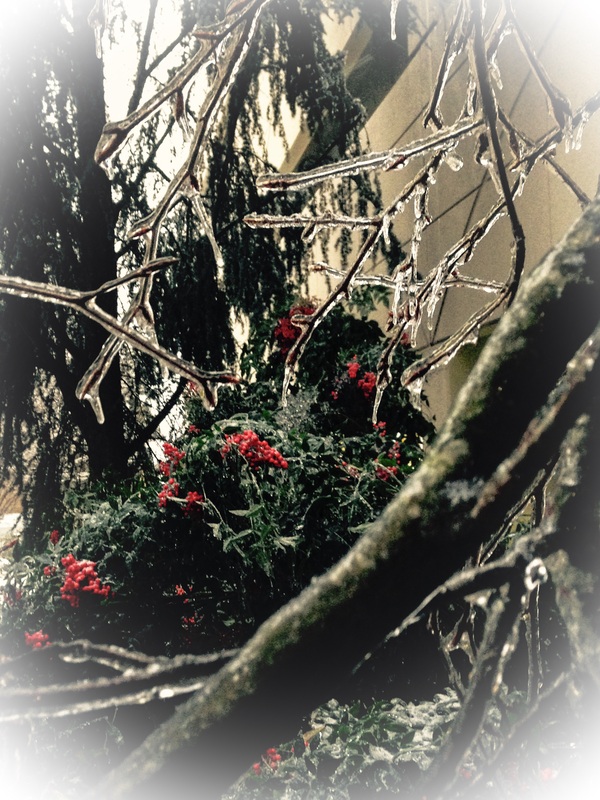 It was wonderful to be tucked in safely at home with husband and dog, snuggled under blankets watching TV. For those few hours, there was no place anyone had to be. There is a quiet sweetness in moments like these; it almost feels as though time has slowed and the world is in a state of suspended animation. I know that it can’t last forever. The quietness eventually gives way to the return of noise and activity, and I have to emerge from the cocoon of icy stillness. 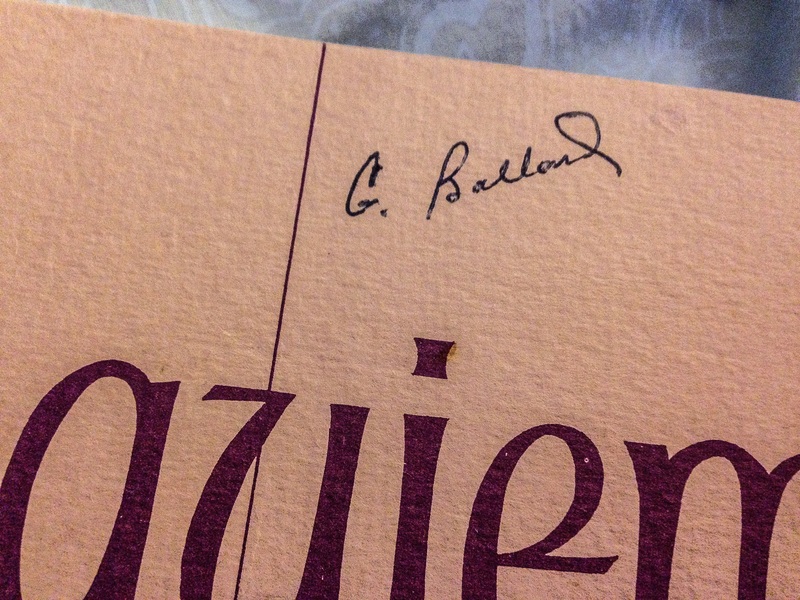 I can hardly believe that it’s been almost 30 years since British composer John Rutter was on campus at Carson-Newman for a choral workshop to introduce his English-language edition of Gabriel Faure’s Requiem. 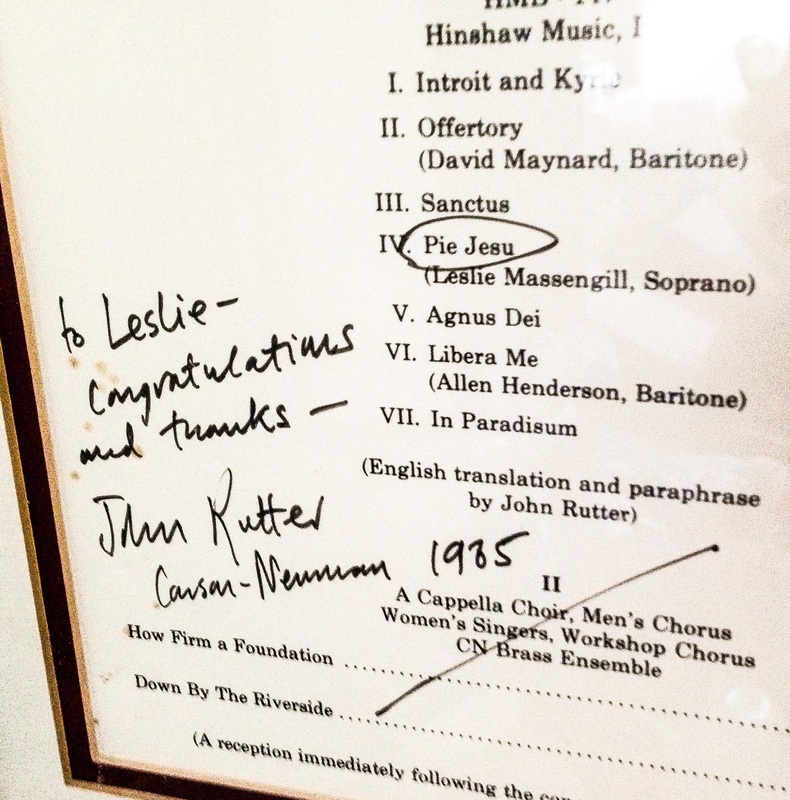 I was a junior, my junior voice recital was that same week, and I had the distinct honor of singing the soprano solo for the performance of the Requiem, under Rutter’s baton. I was in such a twitch in the weeks prior to the workshop and my recital, I don’t think I fully grasped the magnitude of the event at the time. One of my professors told me later that she couldn’t believe I got through that week still standing. Looking back, I realize it was by the grace of God and lots of caffeine! That week was not my first experience with the Faure’ Requiem. 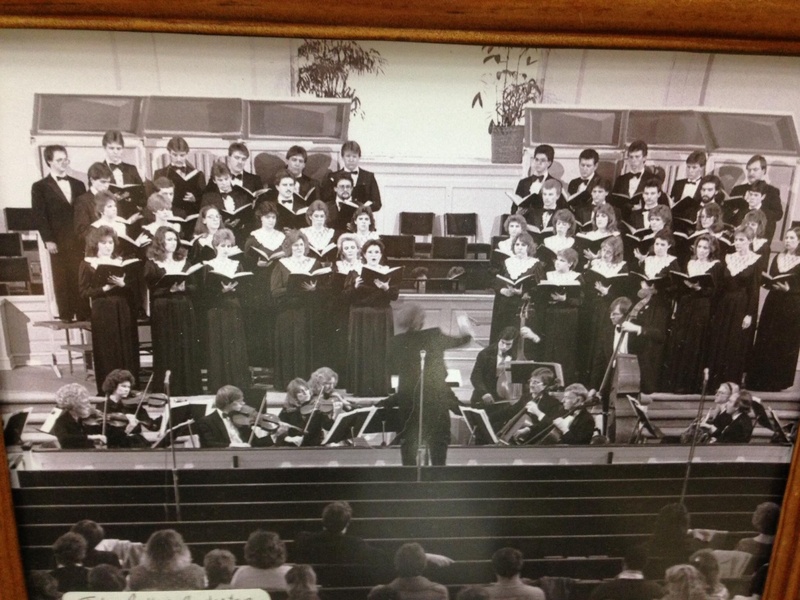 I had performed it in high school with Knoxville’s All-City High School Chorus. 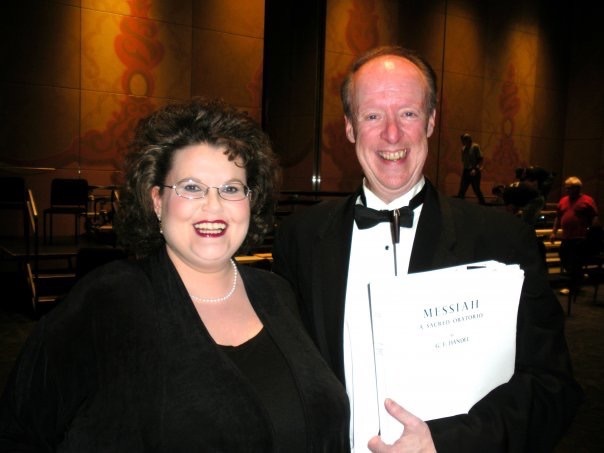 The soloists were adults Dr. Gerald Ballard, the director, had brought in for the concert. Dr. Ballard had been my Mama’s high school chorus teacher at the old South High School some 25 years earlier, so I knew him at first only through Mama’s recollections of him. I later borrowed his Requiem score so I could have the Pie Jesu for scholarship auditions. I misplaced it and then forgot about it until it surfaced some years later. I value it as a prized possession now, and pray that my inadvertent theft can be forgiven. The workshop/performance at Carson-Newman was a highlight of my musical life. Singing a solo with John Rutter conducting was a once-in-a-lifetime experience that I will always remember. 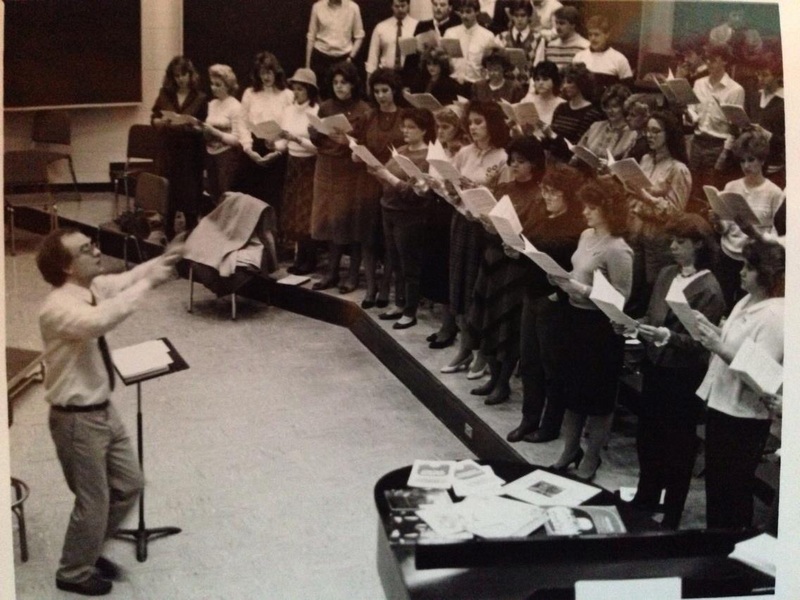 “Doc” Eric Thorson had just the year before taken the reins of A Cappella Choir at school, and it was his responsibility to prepare us for Rutter’s arrival. He told us that Rutter, being an Englishman, might be a more reserved conductor than we were used to, and to pay close attention to what could be very subtle cues from him. As it turned out, John Rutter was a whirling dervish of a conductor, with flailing arms and an outgoing manner. 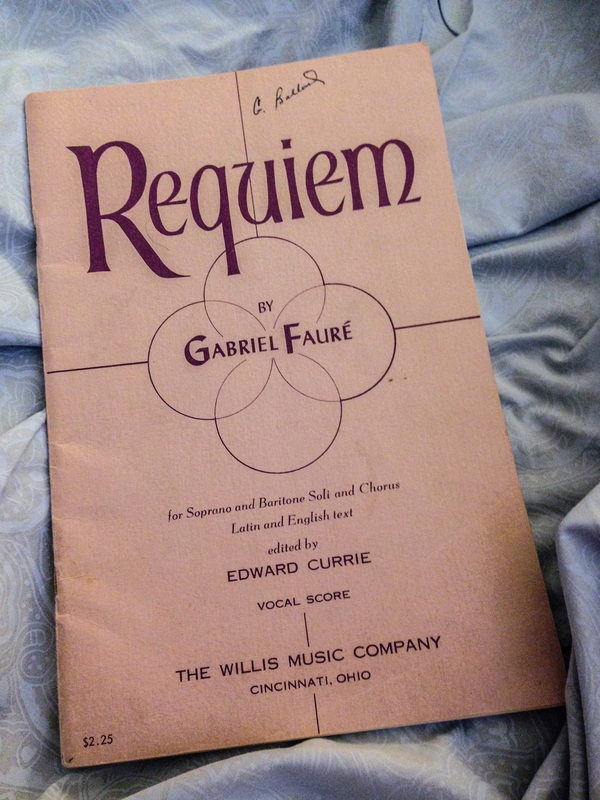 Flash forward to February, 1998, when once again I had the privilege of singing the soprano solo in the Faure’ Requiem, this time under Doc’s direction with Knoxville Choral Society. My sweet-and-spicy Mama had died just a couple of months before, and looking back, I don’t remember what I was thinking auditioning for the solo that time except that I might not be in any shape to sing it. Little did I know the gift God was about to give me. Almost 13 years exactly from the time I sang it at school, I sang it once more. The music itself was the same…but my understanding and experience of it were completely different. Still very much in grief throes from Mama’s death, the text of the whole mass spoke to me afresh, particularly the words of the soprano solo movement, Pie Jesu. At the end of Mama’s illness, she had suffered so much and was so tired. I told her that if she was ready and needed to go on, it was OK. In my family experience and work with hospice, I’ve learned that it is important to give the patient permission to go; it can give them peace at the end of life. My spiritual life during the end of Mama’s sickness was a bleak period when prayers didn’t happen so much as just anguished groans of my heart. Had I been able to actually pray, it would have been for her suffering to end, for peace…for rest. She died, and her rest finally came. Standing on that stage at The Tennessee Theatre singing Pie Jesu once again, Faure’s music spoke peace to me as I took another step in my grief journey. This is the power of Music…the power to heal, comfort, and transform our pain into something of beauty.